Happy Easter everyone... I must thank from the bottom of my heart to every single person who had sent out their prayers for my son to get well soon. Yes, with all ur good wishes and prayers he is doing little better now, but I'll be worried until my doc says he is good to go. His follow- up with the doc is coming tomorrow, so keeping my fingers crossed.. Now coming to the post, it's nothing but a simple home style garlic bread esp for ur lazy days / weekends. So easy peasy to make as well. Making garlic butter: Add a tbsp of butter in a microwave bowl and microwave to melt thoroughly. Add the minced garlic and cook in the microwave for 30 secs. 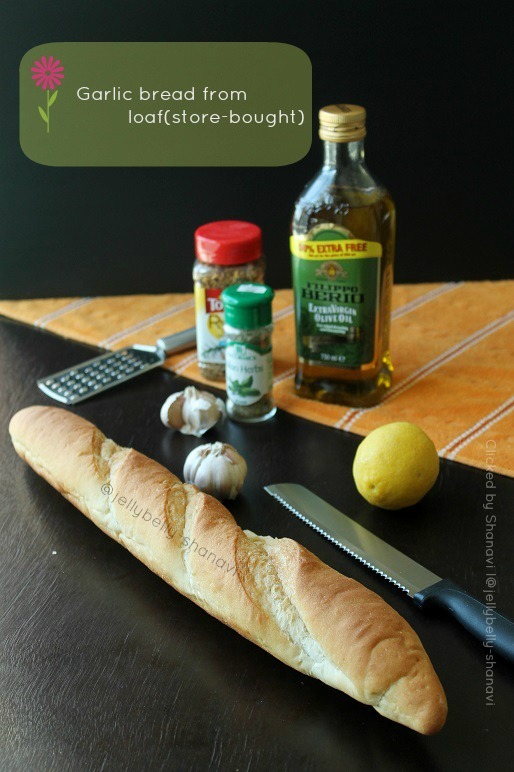 Take the bowl outside and add everything that is listed to make garlic butter. Make a paste and keep it ready. Preheat the oven to 205 deg C/400 def F for 5 minutes. Cut the bread horizontally in the middle and cut into four pieces. Apply the garlic butter on the inside part liberally and sprinkle some Parmesan cheese on top. Bake the bread for 15 minutes, turning the sides once. Also broil the bread for a minute to get that golden brown texture. Since I don't have that option in my oven I just kept the bread for an additional minute. 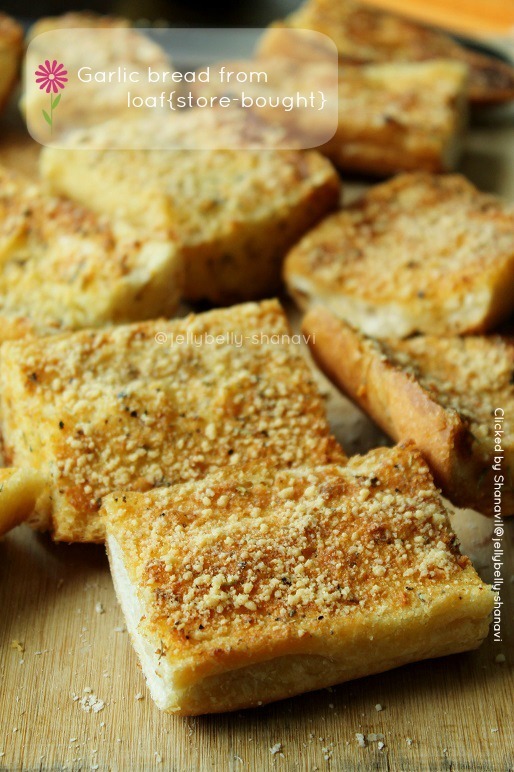 Remove the garlic bread outside of the oven and cut them into squares for easy feed. Njoy as such or with some dipping sauce. 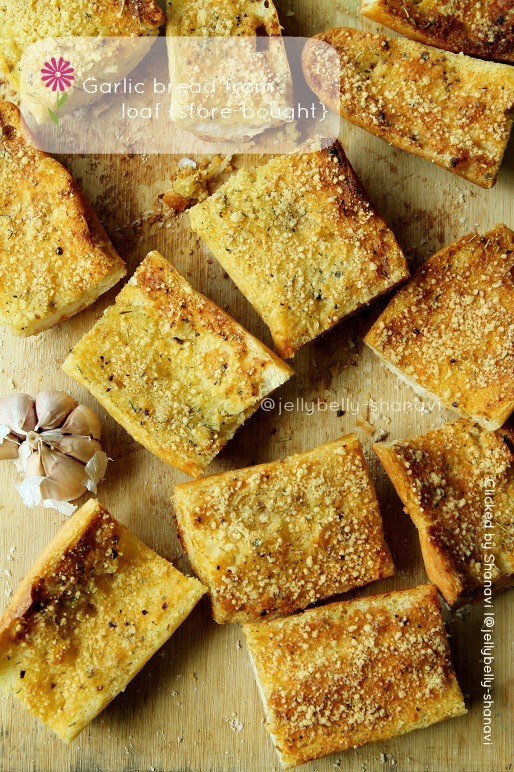 Delicious and inviting garlic bread. Wonderfully prepared. Who can resist to this garlic bread, soo tempting.. Happy to know that he recovered,all is well...Don't worry Shobana!!! 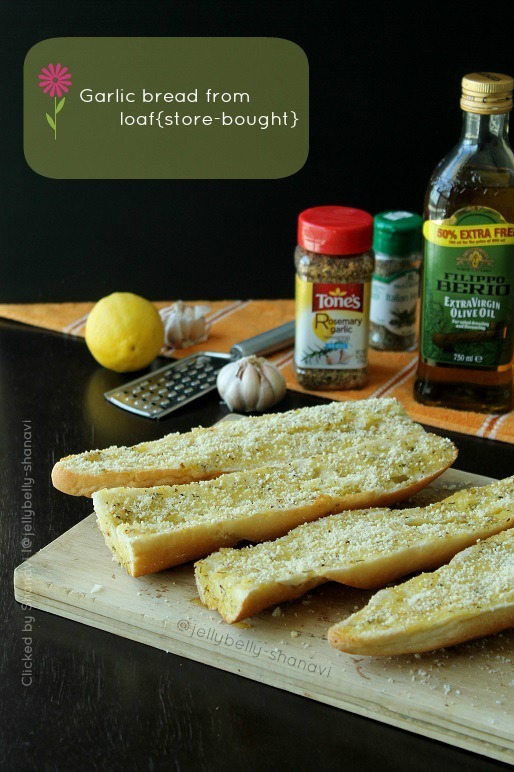 A quick n easy way to have garlic bread ! Mouth watering on your sticks.looks super cute.